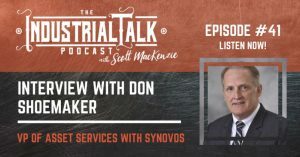 MRO Inventory Management | Synovos VP Don Shoemaker Talks MRO with Industrial Podcast | Synovos - Supply and Assets. In Sync. Synovos Vice President Asset Services, Don Shoemaker, shares his thoughts on the changing dynamics of MRO inventory management, in a recent interview with Industrial Podcast, hosted by Scott MacKenzie. The interview, conducted during the International Maintenance Conference in Bonita Springs, Florida, covers a range of topics, including a brief history of Synovos, the general purpose of the MRO storeroom, how parts are typically handled and what many companies are doing wrong when handling those parts. You can listen to the podcast here or via YouTube.